Greetings from the Queen City, perhaps the worst nickname bestowed upon a U.S. city. I doubt many Cincinnati natives, especially the dudes, use that nickname when telling others where they are from. But I guess it's better than City of Queens. I was here two years ago for the UConn-Cincinnati game, and it's a decent city. The Riverfront area is a fantastic way to waste away an afternoon, as I did yesterday after arriving from Bradley Airport. Paul Brown Stadium is pretty neat looking, and a short walk along the Ohio River to The Great American Ballpark, home of the Reds. 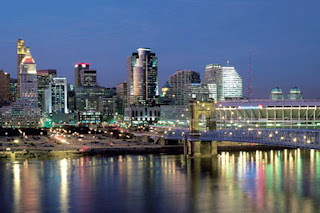 The culinary dish the Queen City is known for is Skyline chili, which is chili splashed over a bed of spaghetti. I'll eat just about anything as long as it's dead. But that looked just disgusting. UConn's Leigh Torbin, aka Lil' Youkilis, loves it, however. Go figure. Driving around, I also noticed Sam Malone ran for a seat on City Council here. Doing a little research, I found out this Sam Malone isn't exactly the lovable May Day Malone-type from Cheers. This guy apparently came from nowhere in 2003 to win a seat (with a name like that, he could have been elected governor of Ohio), then was arrested for whipping his 14-year old kid with a belt. Six months later, he lost the election. Guess you still have to live up to expectations when everybody knows your name. UC's campus is pretty nice. There's a section called Varsity Village where all the athletic fields and facilities sit. They were even showing the USF-Syracuse game on the jumbo-vision at the baseball field, Marge Schott Field (still can't get over that). Nippert Stadium, where the football game is being played today, is in the middle of campus. There are areas where you can watch the game without having to buy a ticket, but you're much better off shelling out a few bucks to get a seat. The stadium is quaint, and every seat is close to the action. Reps from the Sun Bowl are here, and just finished passing out pamphlets to all the Connecticut media. Hey SeanO's Ghost, want to back out of that bet? Injured linebackers Ryan Henegan and Matt Ashmead didn't make the trip. Did they give you a cup of Sun Bowl Kool-Aid with the pamphlet? Or was it in tablet form stamped with the Big East logo?